Temporary housing is typically located in apartments or condominiums and is typically defined as the physical space being rented as well as the suite of services included in the rental itself. Corporate Accommodations offers temporary housing in several areas, with a minimum 30-day stay. What is an executive style home? An executive rental is more commonly referred to as corporate housing. Executive rentals are fully furnished and equipped and include residential apartments, houses or condominiums available for rent on a temporary basis. Generally, executive rentals or corporate housing units are rented for at least 30 days at a time, though lease periods can last for as long as needed. Executive rentals are usually located near metropolitan areas where corporations and companies conduct business. How long is the minimum stay at Corporate Accommodations? Short-term housing starts at 30 days and longer. We do not accept shorter term stays and apologize for any inconvenience. If you’ve got any questions regarding the short-term stay minimum requirement, please contact us at 336-299-1312. 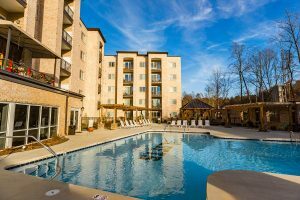 Corporate housing companies work with some of the most luxurious apartment communities in your destination city to make sure that your stay includes all of the amenities, such as community pools, fitness centers, business centers and often extras such as onsite movie theaters or libraries. 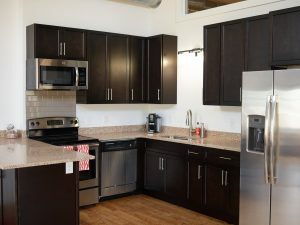 The apartments themselves include such high-end features as granite or marble countertops, stainless steel appliances, hardwood floors and crown molding (these will vary by location, so look into the features at the building that you are offered). Living in an apartment complex alongside permanent residences can make you feel like you are at your home away from home. Which professionals use short-term rentals? Are there benefits to temporary housing? Yes, there are numerous benefits to temporary housing including the ability to explore different towns and cities at your own pace, the ability to purchase a home when you’re entirely ready to as opposed to being rushed to purchase one, and the ability to explore numerous areas in a short amount of time (for example, committing to several back-to-back three-month work assignments in different areas), and lastly, the ability to utilize housing stipends (if your employers permits). Who pays for temporary housing? Many employers will foot the bill for an employee’s temporary housing costs, depending on the industry. For example, there are numerous healthcare companies that will offer housing stipends for traveling dietitians, nurses, physicians, surgeons, etc., which is one reason why temporary housing for healthcare professionals has become more and more prevalent as time has gone on. Temporary housing is a solid option for employers to lessen the anxiety of new or traveling executives or freelancers. They’re less likely to worry about furniture, rent, hotels or dining, which, in turn, would help them better focus on work and be more productive. When combined with the potential savings, this becomes the best option for numerous companies. Which areas do you offer corporate accommodations in? Corporate accommodations are offered in Burlington, Clemmons, Greensboro, High Point, Kernersville, Mebane and Graham, and Winston-Salem. Does Corporate Accommodations have a minimum age requirement? Yes, the minimum age requirement is 18 years old. Does my temporary stay require renters insurance? No, it does not. Renters insurance is highly recommended, though. Are washers and dryers included during the temporary stays you offer? Yes, washers and dryers are included during applicants’ temporary stays. Does Corporate Accommodations offer free parking? Yes, free parking is included. There are plenty of parking spaces to go around. Does Corporate Accommodations require a security deposit before move in? If an applicant’s credit check does not pass a certain number, we do require a security deposit. Generally, security deposits are not required. Do you run a background check on potential temporary stay applicants? Yes, we run a background check on all applicants. If you have any questions regarding our background check process, feel free to give us a call at 336-299-1312. Corporate Accommodations is proud to be a part of the local community. We love to support local organizations that help to make a positive impact in our communities. We also donate we gently used furniture and housewares to organizations that help set up housing for those in need.